A well-worded, bilingual contract show suppliers you are a professional, serious about IP/Quality/Lead-times and significantly increases your chances of success should you enter into a court case with a supplier who has broken the terms of the contract. This service is provided by www.AsiaBridgeLaw.com, visit their rate sheet to get started. China is a first-to-register rather than first-to-market system. Patent and Trademark registration is straight forward and affordable. Once registered you will be surprised at how level the playing field is should your encounter violations and seek the involvement of Chinese courts. Fees depend on the complexity of the project but are usually less than 1/3 the costs of a similar project in US or Europe. Having China-based, English speaking legal counsel on retainer is a cost effective way to avoid pitfalls and ensure your business strategy is sound. Counsel is not only there to get you out of the occasional crisis but the General Counsel service is designed to help clients improve the day-to-day running of their businesses. When the client needs support our lawyers and support staff are ready to help immediately. No need for lengthy contract negotiations or wasted time getting the lawyers up to speed. If you are importing, exporting or based in China, General Counsel can assist in the following areas: Drafting various legal documents, Negotiations with Chinese based entities, Contract review & creation, Legal opinion, Government relations, Intellectual property protection, Regulatory compliance, Corporate governance, Labor law, Tax codes, Mergers & acquisition, Due diligence, Litigation, Crisis management & Other areas. Unfortunately there is no Better Business Bureau in most parts of Asia where you can take your grievances. Unless your loss is very large, you will find very little support from government agencies and local police. 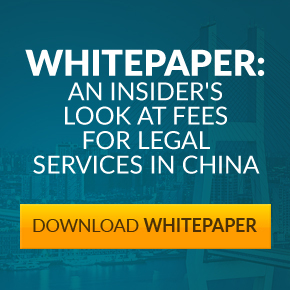 This page (http://www.asiabridgelaw.com/dispute-resolution/) is designed to explain your options and introduce affordable, English speaking lawyers who can help in China. Has a business partner in China broken the terms of your agreement? China-based, English speaking lawyers and collection agents can issue demand letters and negotiate settlements. Learn more here (www.AsiaBridgeLaw.com).